Wawanesa is a solid, trustworthy company with competitive rates, straightforward practices, and a good reputation. If you are a driver with a good driving history in California or Oregon you should definitely put them on your bucket list to get quotes. On the flip side, if you have a poor driving record, you will see your premiums skyrocket making shopping elsewhere a better option. Note: In the illustration above, Wawanesa is the 3rd least expensive carrier offering quotes at $1,844 per year for full coverage in Oregon. Chubb is more expensive with a quote at $1,968. PEMCO offers higher quotes with a price at $1,870. Progressive and Grange offer quotes substantially lower for a 25 year old driver. The fact of the matter is, you are going to find every single auto insurance company with negative reviews. With JD Power & Associates ranking them in line with USAA and Ameriprise Financial Services this is a company I had to take a look at. Who is Wawanesa Mutual Insurance Company? 1 Who is Wawanesa Mutual Insurance Company? 1.2 How do Premium Rates Compare Against the Average? 1.4 How do They Keep Premiums so Low? 1.6 Seeking Only the Good Drivers? 1.7 Who is a “Good Driver”? 1.11.1 Verdict: Who is Wawanesa Good For? Wawanesa was founded in Wawanesa, Manitoba, Canada in 1896 specializing in farmers’ mutual insurance. In 1975 they started selling insurance in California then branched out to Oregon. The US branch is a subsidiary of The Wawanesa Mutual Insurance Company, one of the largest insurance carriers in Canada. They currently issue policies in two states, California and Oregon. While they sell homeowners, renters, and condo insurance, auto is their main product. Note: The two companies which are able to offer lower quotes for a 30 year old driver are Grange and Progressive. Both offering quotes at $1,355 and $1,322 respectfully. Wawanesa offers quotes at $1,411 which is competitive. Chubb and PEMCO offer fairly higher rates with quotes at $1,498 and $1,555. Wawanesa has received extremely good marks from independent reviewers like JD Power & Associates and the Better Business Bureau. In 2018, JD Power listed them as the third best auto insurance company in California and, in 2013, they had the number one spot. A.M. Best has rated them an 85 out of a possible 100. They also have an A+ rating with the BBB. How do Premium Rates Compare Against the Average? The average cost of auto insurance in California is $79 per month for minimum coverage. The quote I received from them for a 2016 Honda Civic, male driver with the minimum required insurance in Long Beach was $49.44. Note: Illustrated above are the yearly quotes for a 40 year old male driver in Long Beach, California with minimum coverage only. The two companies cheaper than Wawanesa ($600) are Progressive and Century National. Both offering quotes at $554 and $567 per year for minimum coverage. Nationwide and Allstate are more expensive with quotes fairly higher priced at $621 and $648 respectfully. That is pretty big savings! Bear in mind, I had to use a driver with a clean record to get a competitive price. According to their website, if you have any negative marks, you are likely to see much higher rates. Below is a list of direct competitors for companies licensed to do business in either California or Oregon. The two areas where Wawanesa is offering policies. Depending on your state or zip code you reside your quotes may vary. When I did my analysis of quotes I noticed that younger drivers are not as competitive for the company. Only two are higher PEMCO and Chubb. State Farm and Progressive are consistently able to offer lower quotes throughout the age spectrum for drivers with a good driving history. 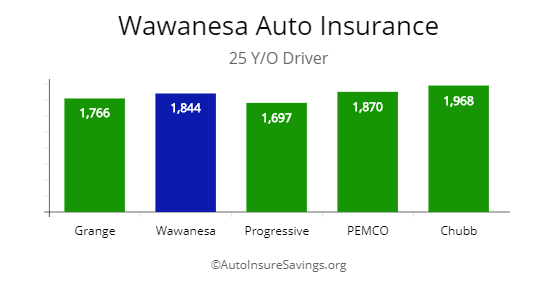 For older drivers, Wawanesa is very competitive with a quote $611 per year for full coverage for a 55 year old driver. The only other two offering lower quotes are State Farm and Progressive. Their sweet spot seems to be for drivers from 35 to 55 years of age and older. After doing my analysis of quotes, if you are a driver with a good driving history, Wawanesa is certainly a company to put on your list to get quotes. How do They Keep Premiums so Low? The two main cost savers I found are their lack of advertising and the fact they attempt to exclusively insure good drivers. Wawanesa prides themselves on mainly operating through direct solicitation. This means that they do not hire independent insurance agents to find customers or advertise. They contact potential clients direct, usually by mail. The money they save by doing this is passed on to the client through low rates. Note: For a 35 year old driver the cheapest rates are found with State Farm and Wawanesa. Both offering quotes at $1,164 and $1,200 respectfully per year for full coverage. Chubb, Farmers, and PEMCO are all priced higher. A sweet spot for the company is older drivers from 35 years of age and up. Which is typical of most auto insurance companies. The company claims over 90% of their new customers come as a result of referrals from current clients. In addition to the advertising savings, the company must be doing something right if customers are recommending the company to their friends. It is a good sign that Wawanesa has managed to stay in business for close to 50 years in the US through word-of-mouth referrals. By purposely relying on referrals as their main method of growing their clientele, they have made it clear that customer satisfaction is important to them. Seeking Only the Good Drivers? Wawanesa’s biggest drawback is how strict they are in driver requirements. However, only insuring low risk drivers is another way they save money which can be passed on as savings to their customers. On their website they state up front they only insure state-defined “good drivers”. Who is a “Good Driver”? For California, to qualify as a good driver you cannot have more than one “point” in traffic violations or at fault accidents in the past three years. Almost all traffic convictions are counted as one point. Most at fault traffic accidents count as one or two points depending on whether or not there was bodily damage. A perfect record will get you pretty amazing rates that are lower than their competitors. A record with some blemishes but still qualifying as a good driver will still get you insured but rates will be higher. If you are anything other than a good driver, you might be out of luck with Wawanesa. 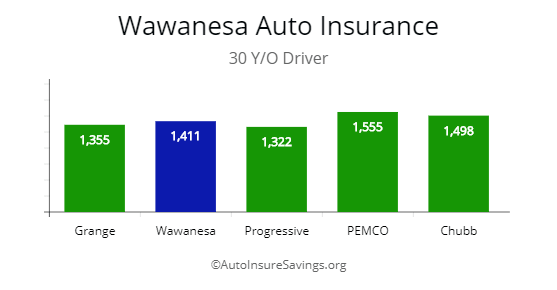 Note: In the illustration above, Wawanesa is the cheapest option by price with a quote at $944 for a 45 year old driver. Note included is Progressive which is the only company offering lower quotes. (please see table above). All other companies including Farmers, State Farm, PEMCO, and Chubb offer higher quotes. If you do qualify for Wawanesa’s low rates, what types of coverage options are there? They are pretty straight forward in what options they provide without having any gimmicks or extras that make them stand out from other carriers. Beyond the state required bodily injury and property damage coverage, they offer medical, fire and theft, collision, roadside assistance, uninsured motorist, rental coverage, and manufacturer replacement part coverage. Much like everything else they do, Wawanesa’s list of discounts is clear and straightforward. Unlike other companies, their list is not exceptionally unique or long. They offer discounts for multi-car policies, mature drivers (drivers over 55 who complete a special “mature driver” course offered by the DMV), driver training, and loyalty. However, if you are a good driver, you are already getting exceptionally low rates. If you have additional items to insure, such as home or rental, you may find the premiums very competitive when applying discounts. Note: For a 55 year old driver with a clean driving history you will find most any of the companies illustrated competitive. Wawanesa is able to offer the 3rd cheapest quotes with a price at $611 per year. Both Progressive and State Farm offer lower rates with prices at $598 and $610 respectfully. The only drawback is the limitation of California or Oregon. If you do move outside of either state you will have to drop their coverage. As stated earlier, Wawanesa stakes a lot on their reputation with their customers. While there are negative customer reviews on many sites, many of them have resolutions in progress. Most of the other negative reviews I found were centered around the difficulty of getting in contact with customer service agents. Despite the negatives, when looking at several different review sites, there were very few complaints across the board regarding policies, issues with claims, estimations, or settlements. This means that, despite possible difficulty in contacting a service agent, you will likely be getting good treatment from a company that is not trying to undercut you in pay-outs. Odds are, if you ever get into an accident, the company will treat you fairly. Just be warned: if you are found at fault, your rates will likely see a significant jump. Verdict: Who is Wawanesa Good For? If you are a safe driver in Oregon or California with a clean record, Wawanesa will give you amazing rates and fair dealings so long as your record stays clean. Their policies are straightforward and simple, so if you are looking for a long list of extra perks such as rideshare or mechanical coverage, you will have to shop with another company. If you do not have a stellar driving record, you also may have better luck looking elsewhere. However, if you meet their driver’s criteria, it will definitely be worth getting quotes from them.